These are charts showing trends by WEEK for the past 6 months, through April 18th. Weekly data is not as reliable as monthly or quarterly, but it’s useful to see trends. Except for the median price charts, these apply to SFDs, Condos, TICs and 2-4 Unit Bldgs. Condo Median Price (Sold): as with houses, the median price seems remarkably stable within a relatively narrow band. For all districts except 3 & 10. There have to be some good deals in here. These charts track recent SF home sales by low, high and median sales price, and average dollar per square foot ($/sq.ft.) for the 6-month period of 10/16/09 – 4/15/10. Changes in median price and average $/sq.ft. don’t necessarily signify a change in market values, as both statistics can be affected by changes in buying trends, "unusual" events, and, when the number of sales is small, by a few specific sales clustered well above or below normal. Comparing this data to the previous 6-month period, changes in median price and average $/sq.ft. most commonly ranged in the 0 – 5% range, plus or minus: no definitive city-wide trend can yet be determined, though the increasing market demand would typically exert upward pressure on prices. Finally, remember that sales data is always 4 to 8 weeks behind the market, since that is the usual period of time between acceptance of offer and the final closing of the sale. Within the charts, neighborhoods are listed in order of median sales price. If a price is followed by a "k" it references thousands of dollars; if followed by an "m", it signifies millions of dollars. "REO" refers to the sale of bank-owned properties (typically pursuant to foreclosure). Many aspects of value cannot be reflected in general statistics: curb appeal, age, condition, views, amenities, outdoor space, "bonus" rooms, parking, quality of location within the neighborhood, and so forth. Huge disparities may appear between low and high prices for a property type in the same area: a 3-bedroom house may be a 4000 sq.ft. Victorian or a 1500 sq.ft. 1950′s era home. Thus, how these statistics apply to any particular home is unknown. N/A signifies that there wasn’t enough trustworthy data to make the calculation. REO refers to bank-owned properties. These properties usually sell at a discount to a non-REO property, and are mostly concentrated in the city’s less affluent southern border neighborhoods for REO houses, and the city’s southern and eastern neighborhoods for REO condos. San Francisco has one of the lowest rates in the Bay Area and state for foreclosure sales and sales of bank-owned properties. REO sales do however constitute a relatively hot market segment. 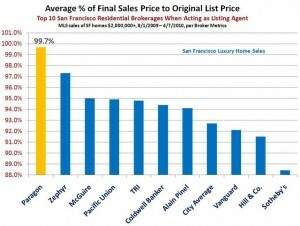 The Median Sales Price is that price at which half the properties sold for more and half for less. It may be affected by "unusual" events in any particular period or by changes in buying trends as well as by changes in value. Low Price & High Price are self-explanatory, but be aware that the low price listed might be for a home that needs significant work just to be habitable. Or it could be a distress sale of a banked-owned property. An asterisk signifies a confidential sale and the price shown is the list price, not the sales price. Such sales may distort the statistics. Dollar per Square Foot is based upon the home’s interior living space and does not include garages, unfinished attics and basements, rooms built without permit, decks, patios or yards. These figures are usually derived from appraisals or tax records, but can be unreliable or unreported altogether. All things being equal, a house will have a higher dollar per square foot than a condo (because of land value), a condo will have a higher $/sq.ft. than a TIC (quality of title), and a TIC will have a higher figure than a multi-unit building. All things being equal, a smaller home will have a higher $/sq.ft. than a larger one. In San Francisco, the highest dollar-per-square-foot figures, $1000 – $2000, are generally found in the most prestigious houses in affluent neighborhoods and, especially, in luxury penthouse condos with staggering views. Statistics such as these are generalities, oft times subject to surprising fluctuations due to a variety of reasons. Average figures in particular may be distorted by one or two sales substantially higher or lower than the norm, especially where the sample size is small. New-development condo sales not reported to MLS — of which there are many in SF — are not included in this analysis. All information contained herein is derived from sources deemed reliable, but may contain errors and omissions, and is not warranted. There is an an excellent article in the SF Business Times about the rebound in the condo market. Here is the Socketsite coverage of the article that has links to further articles. What’s wonderful about these charts is how consistent our performance is, whether for houses, condos, luxury homes or all homes – we’re at the top for Sales Price to Original LP %, and for Average DOM when acting as listing broker. As shown in the updated charts below, buyer demand in the San Francisco home market continues to strengthen, while supply (as measured by months’ supply of inventory) continues to tighten. Median prices remain surprisingly stable, jogging up and down in small increments over the past 4-5 quarters, but always staying within a 3% range. The spring season is typically an active sales period, though some pundits believe buyers have been rushing in recently because 1) the Federal Homebuyer Tax Credit is due to expire this month, and 2) an expectation that mortgage rates will rise now that the Fed has just ended its mortgage bond buying program. However, because of income and purchase price limits, and the higher cost of housing here, the Fed tax credit has never impacted SF like it has other areas of the country, and now a new California tax credit has been announced with no income or price limits. Interest rates have started to tick up a little, but remain very low by historic standards. Under a new California law, a homebuyer may receive up to $10,000 in tax credits as either a first-time homebuyer or as a buyer of a brand new home. With the Federal tax credit due to expire soon, there is a brief window of opportunity in April to qualify for up to $18,000 in combined federal and state tax credits. This would require an accepted contract to purchase before April 30 with close of escrow occurring May 1 to June 30. Here is a link to a chart of details and eligibility criteria for both programs. This should be reviewed with your accountant. Median price is that price at which half the sales were higher and half were lower — it can be affected by changes in value, or by changes in buying trends, or by unusual market events. Months’ Supply of Inventory (MSI) is that number of months it would take to sell existing inventory at the current rate of sale — the higher the MSI, the weaker the demand. Average Days on Market (DOM) are the average number of days it takes for a listing to accept an offer — the lower the days on market, the faster homes are selling. Statistical parameters are generalities which may fluctuate up and down, sometimes for no discernible reason. All data is from sources deemed to be reliable, but may contain errors and omissions, and is not guaranteed. Sales not reported to MLS, such as many new-development condo sales, are not included in these statistics. SF Homes Accepting Offers As the spring selling season began in earnest, the number of listings accepting offers increased to their highest level in well over 2 years.